Here’s how to make a pony bead garland for your Christmas tree or holiday decorating. 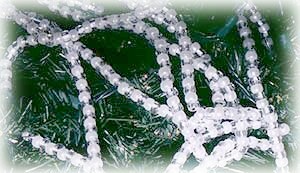 Simply strand beads onto a ribbon strand. I used one white bead and then one clear. I continued adding beads for a total of about 1200 beads, but you can make your garland as long, or as short, as you wish. To secure the end beads in place, simply tie the end of the ribbon around the end bead. You will feed the ribbon through the bead then bring the end together with the strand and knot to secure.